For centuries, adolescent girls who listened to “the period talk” heard only about bleeding, menstrual cramps and how to use whatever menstrual aid was popular at the time. However, there’s a lot more to a new monthly menstrual cycle than just getting a period. It’s also a time when a girl begins a new monthly hormone cycle that will impact her moods, health and behavior every day–and continue to do so for the next 40 or so years. Sharing how hormones impact moods, health and behavior can be powerful information for a young girl who may be experiencing new mood shifts, drops or surges in energy or changes in health. She will know that they are normal, natural, sometimes frustrating and also sometimes beneficial effects of her new hormone cycle, which can ease worry and prevent confusion. It’s my mission to ensure that the current generation of girls have this vital hormone information starting with their very first cycle–and they can then pass this important information on to the following generations. This way, all girls can have a clearer understanding of themselves, improve their health and make every day of their cycle better. This is why I’m asking you to do something revolutionary: If you’re a parent, caregiver or teacher who gives the period talk to tween girls, I’m asking you to update your period talk to include a basic introduction about hormones. I’ve made it easy for you to do with my free eBook, The New Period Talk: Introducing Girls to their Hormone Cycle. 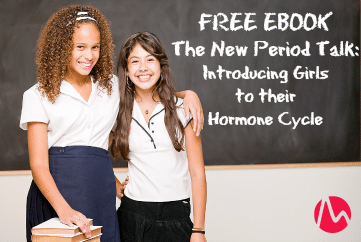 This free eBook guides you through how to update your period talk by providing you with basic explanations about how hormones impact a girl during each week of her monthly cycle. In addition, there’s a separate guide for the girl receiving the period talk that fills in details with easy-to-grasp terms and ideas that you can print out and share. I have two editions of The New Period Talk–one edition for parents and caregivers and another edition for teachers who deliver the period talk in their classrooms. Want the parents and caregivers edition of The New Period Talk eBook? Want the teacher’s edition of The New Period Talk eBook? Thank you for joining me in my mission to educate girls about their hormones. With your help, we can ensure that all future generations of girls and women have this vital information starting from their very first cycle.